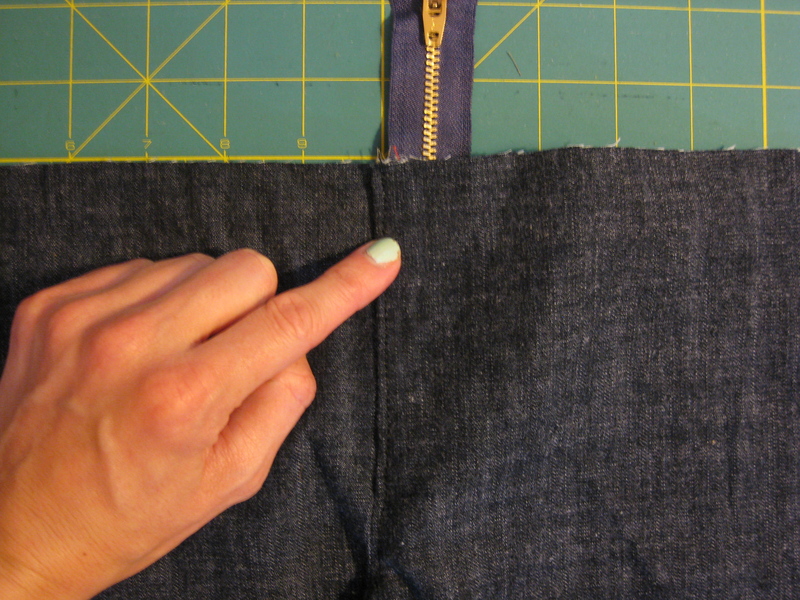 There are two things that have always bothered me about the center back crotch seam on jeans (now there’s something only someone who sews might say…). First, the way things are usually constructed, the seam allowances are pressed to one side of the seam line. 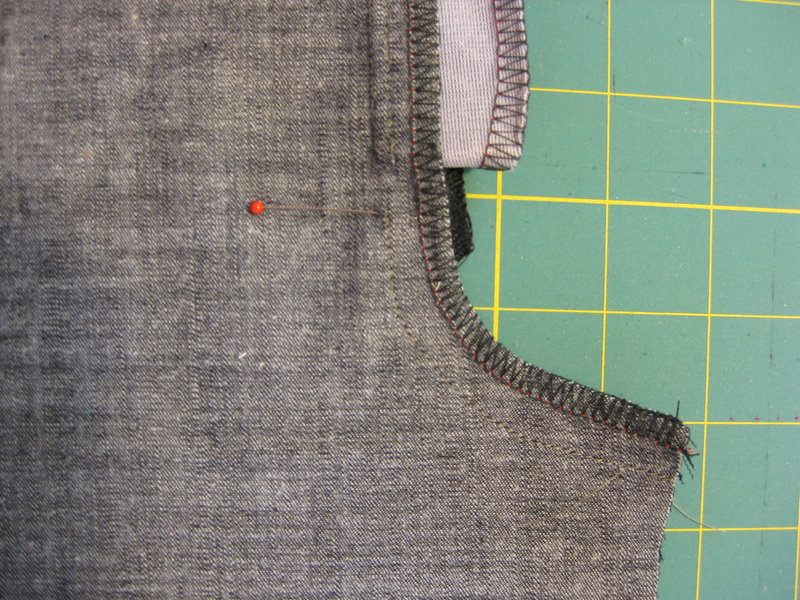 This means that the top stitching is not centered, and the pockets are not equidistant from the top stitching. You can space the back pockets differently on each side to offer a little more symmetry, but ultimately I would prefer a centered seam. The second thing that annoys me is that the original stitching line can end up looking a little bit strained. 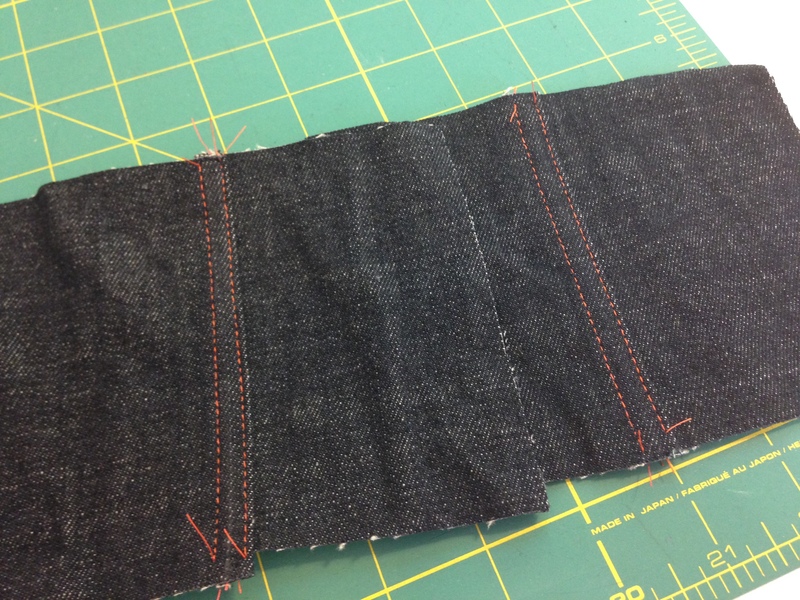 Even though the seam is perfectly secure from all the lines of stitching, sometimes you end up pulling on the original seam and you’ll see the lighter part of the denim showing through. Hard to explain that one, but if you’ve ever noticed this, you know what I’m getting at. 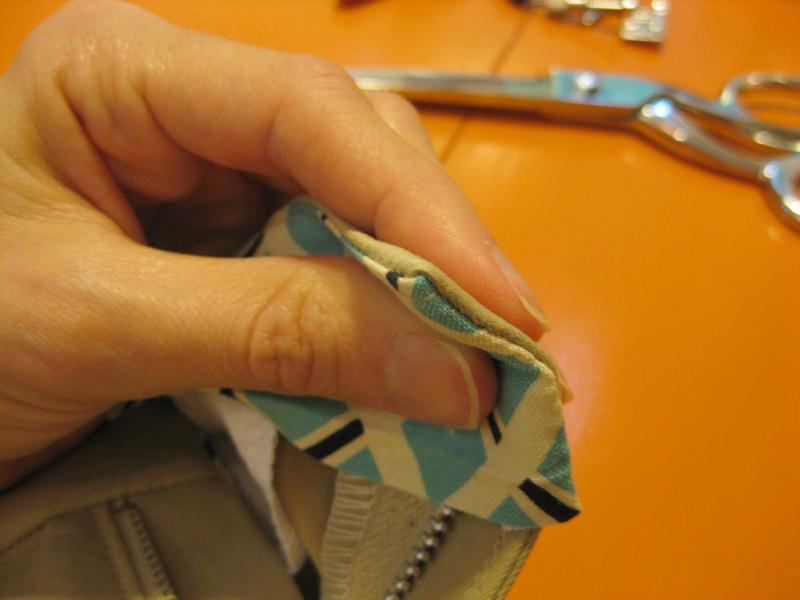 Take the fabrics you will be joining, abut them, and sew a wide zig zag stitch to join them. Do not overlap the fabric. It doesn’t matter what thread you use, because this stitching will be hidden at the end. This part gets difficult to explain, so bear with me and when in doubt, refer to the photos. Press the fabric just to one size of the zig zag stitching (about 3/16″ from the abutted edge), then turn to the other side and do the same. If you look at a cross section, your fabric will form a “Z”. 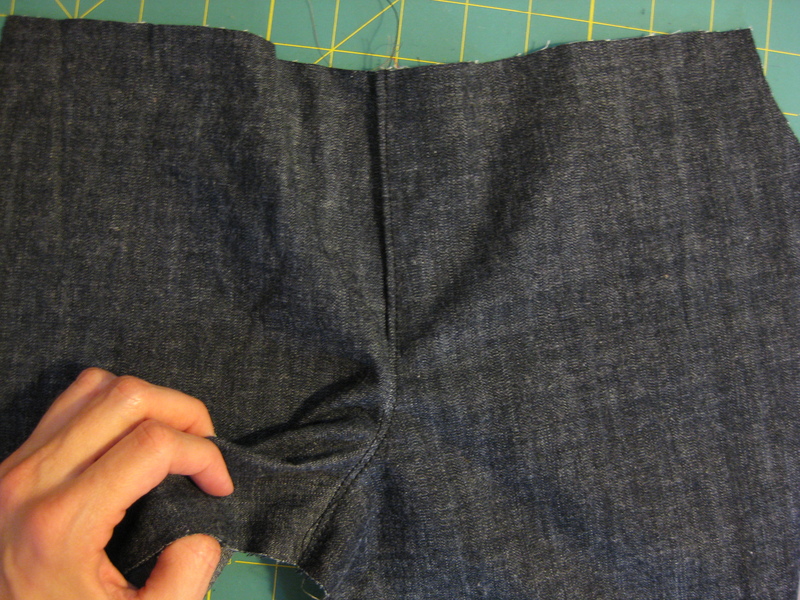 The abutted seams are on the inside of the folds and completely covered. 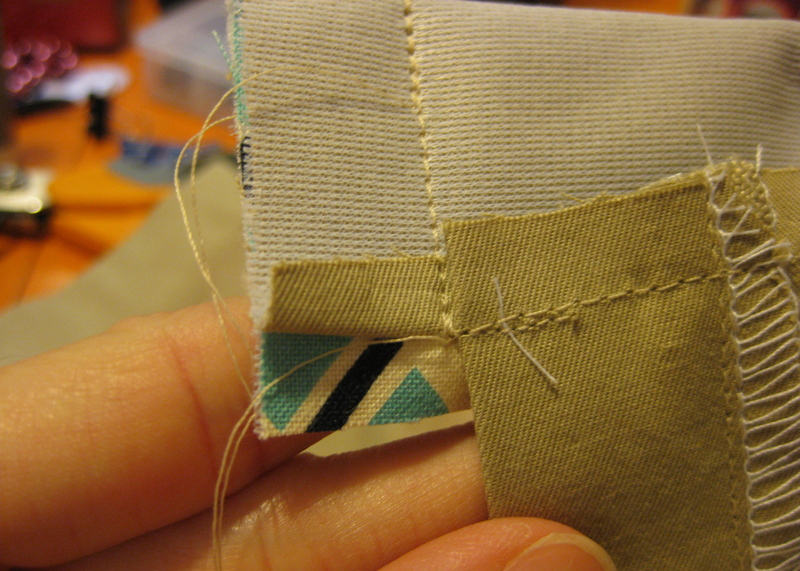 Top stitch from the right side, then make a second pass, which will just catch the folded edge on the wrong side. 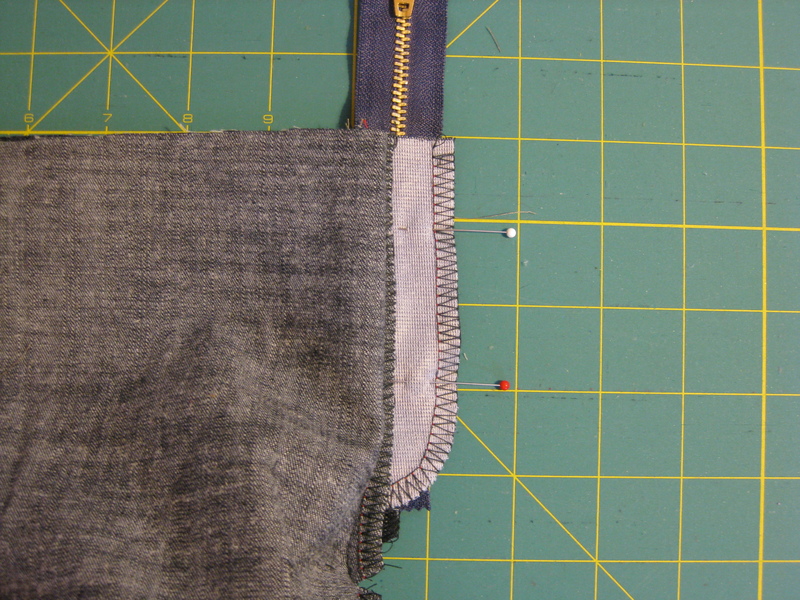 I like to use my blind hem foot as a guide, and I found that the folded ridge on the under side is lumpy enough that the foot can follow it for the second pass. 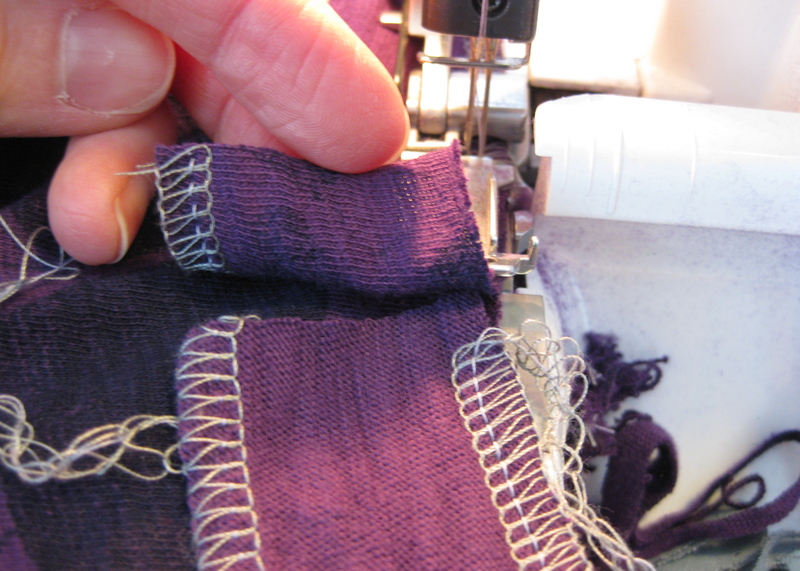 This eliminates any guesswork or need to sew from the wrong side. Given that most machines have difficulty producing a nice stitch with top stitching thread in the bobbin, this is most useful! At the begining I had marked the 3/8″ SA, and you can see that my marking is neatly centered. 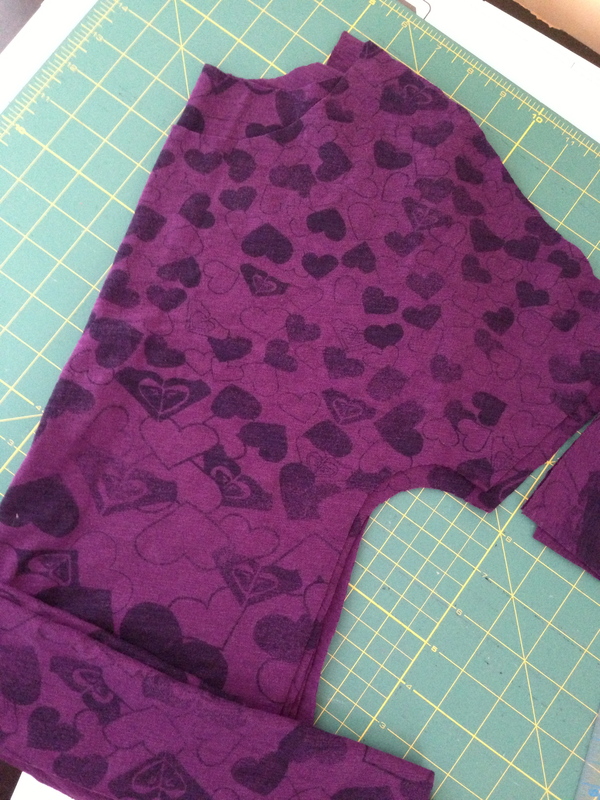 Also, you will note that the finished seam has three layers of fabric, making it perfect for thicker fabrics. The second method is essentially the same as the first, but it ends up being a little bulkier, and requires a 1/2″ SA. Start by pressing one of the SA’s to the right side by 1/4″, and the other SA to the wrong side by 1/4″. Open it up, and overlap the pressed SA’s, using the pressed line as a guide. Once overlapped, run a line of basting stitches down the center. 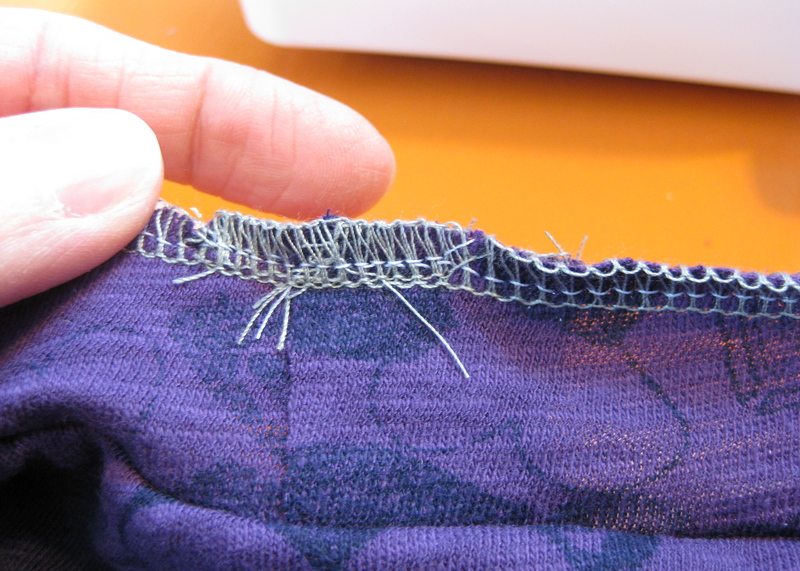 Again, thread doesn’t matter, the stitching will be hidden in the final seam. Since the seams have already been pressed, top stitch as before: first at the outer folded edge, then again along the inside folded edge. 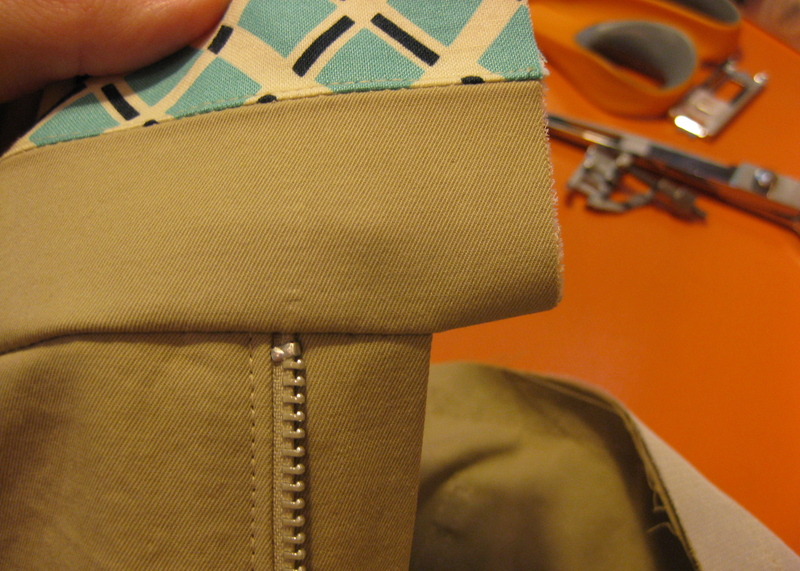 Since the fabrics are overlapped instead of abutted, you end up with 4 layers of fabric in the seam. You can see from my chalked marking that I got off ever so slightly, but this is a sample and a super unprofessional blog, so I didn’t feel compelled to re-do it. It occurs to me that you could also mark 1/4″ on one SA, overlap the other fabric, baste, then press the seams after basting. Give it a go on some scraps and see what works for you. 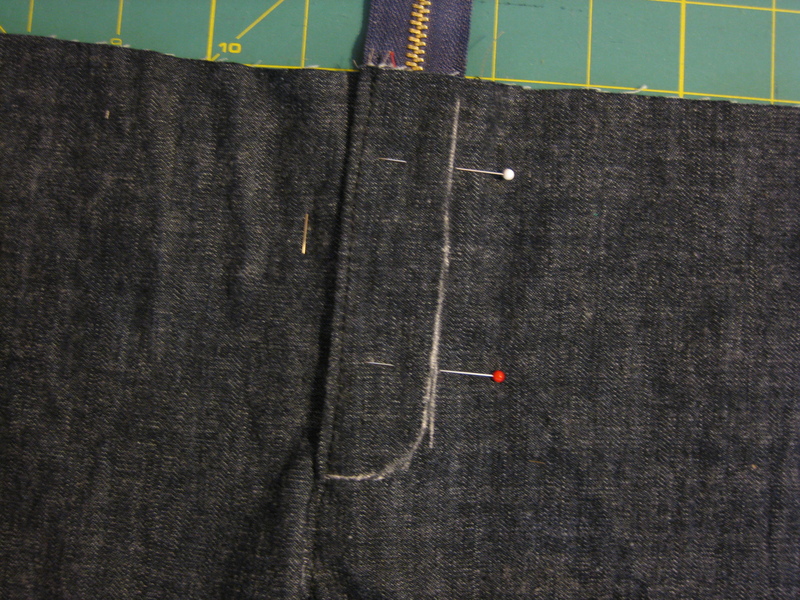 Before you ask, I did try the first method (though not the second) on a curved edge in order to simulate the back crotch seam of jeans. I found that I had absolutely no issues with the curve. 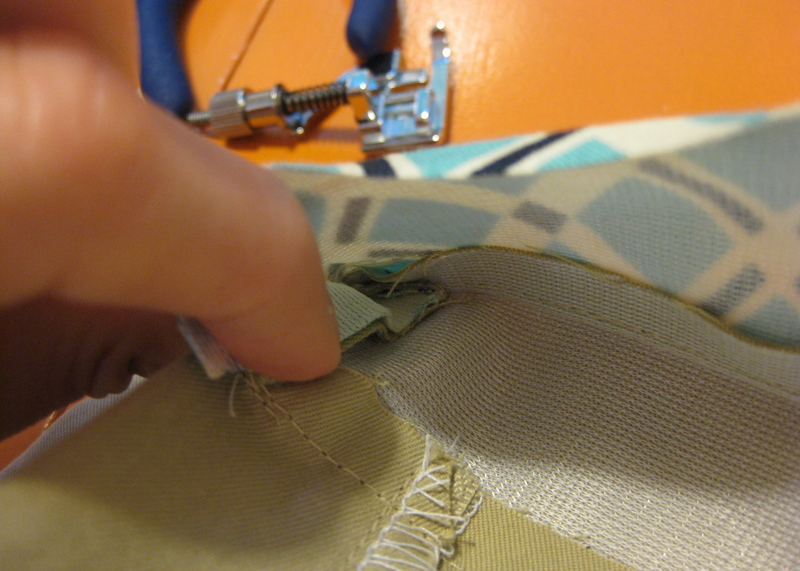 If anything it was easier because all the top stitching was closer to the edge of the fabric. When you press a curved edge to one side, the edge of the fabric is shorter than the line where you would be top stitching. 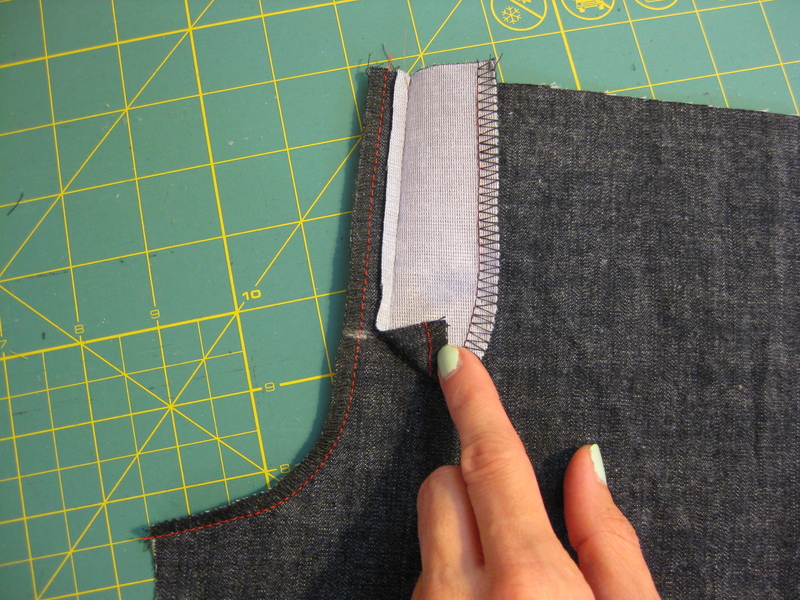 You can clip the curve if you are faux flat-felling, but the seam will be inherently weaker. That’s not to say you’re in danger of splitting your jeans, but if there’s a better way I’m all for it. I hope you give this a try! i’ve thought way too much about how to cleanly finish the hem for a wrap top, so i thought i would share my most successful method. 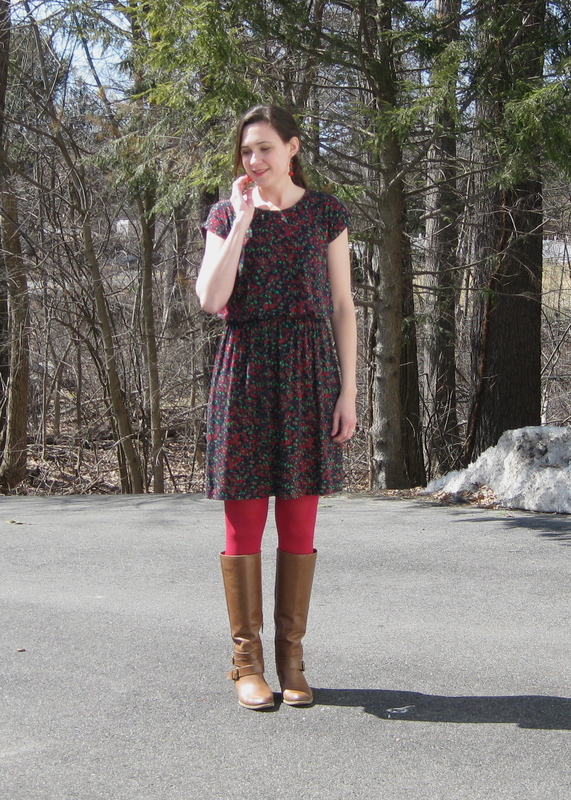 my thoughts on this started with my coppelia wrap cardi and my dissatisfaction with the pattern’s instructions. i like the idea of a hem band because often the knits i would choose for this kind of cardigan would be difficult to hem with a twin needle (since i don’t have a coverhem machine in my arsenal). i was determined to find a better way, and was able to have a second (and third) try on ballet wrap tops i made for two of my girls. 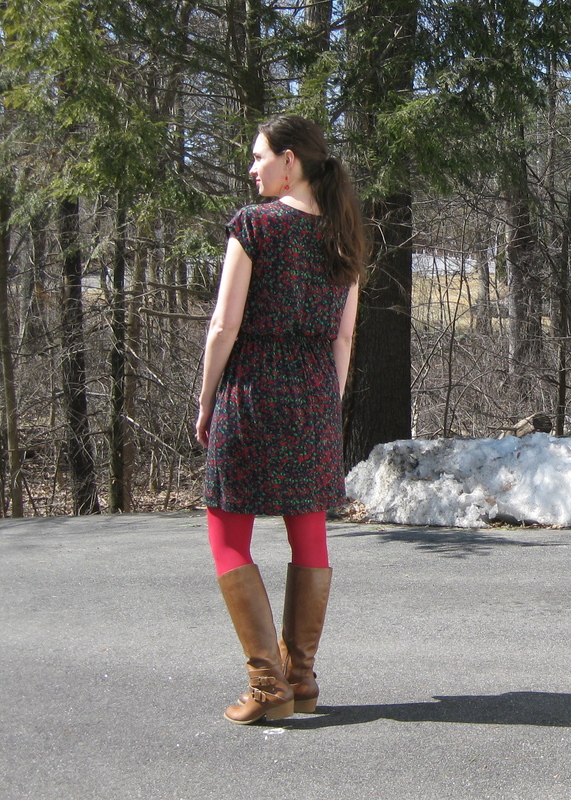 i used burda 12/2011 #143 and made a few pattern changes so i could finish all the edges with bands. i cut 2″ off the sleeve hem (and replaced it with a wide cuff), 1″ off the bottom hem, and simply left the neckline as is on the pattern. 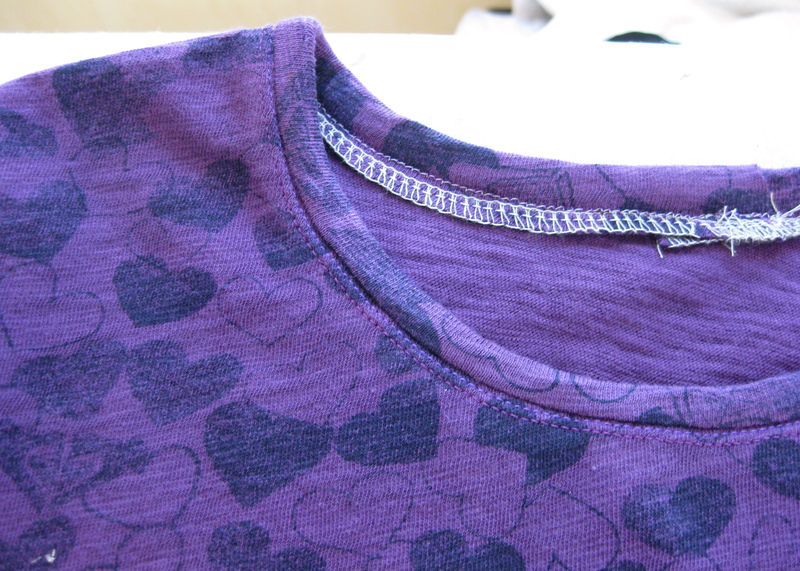 the pattern has a wrap around edge binding, so adding the band as i did brings the neckline in a little. 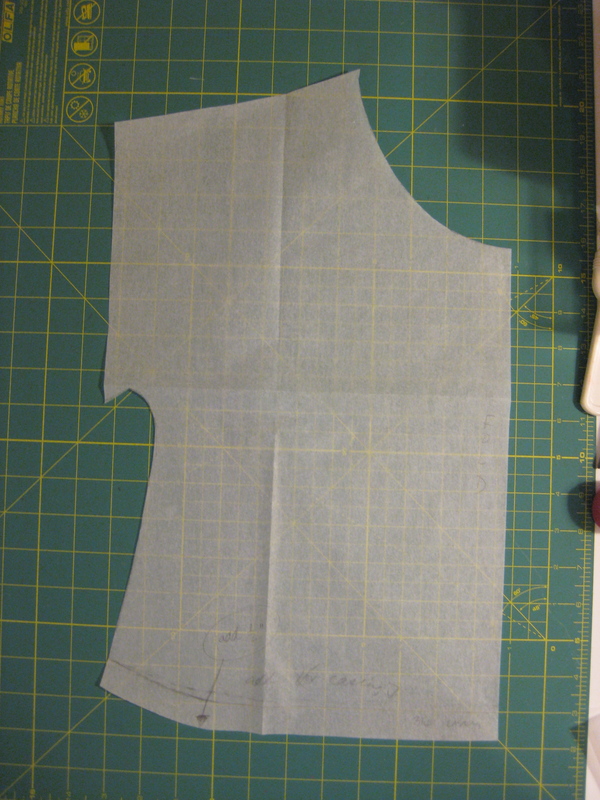 however, looking at the picture on burda’s model, the neckline looks pretty wide, and adding a neckband band fixed that. so here’s how i do the hem band and ties: take the tie pieces and sew the side and one end, and turn them right side out and press (this burda pattern has you do more of a spaghetti strap thin tie, but i prefer the look of a wider tie). the rest you can see in the following pictures. i love how easy this is, and so much less fiddly than the coppelia instructions. as far as this particular pattern goes, i made up the girls standard RTW size (i didn’t measure them for size) and the fit is a little bigger than i would have preferred. however, they should be able to get at least two years of wear with these sweaters. 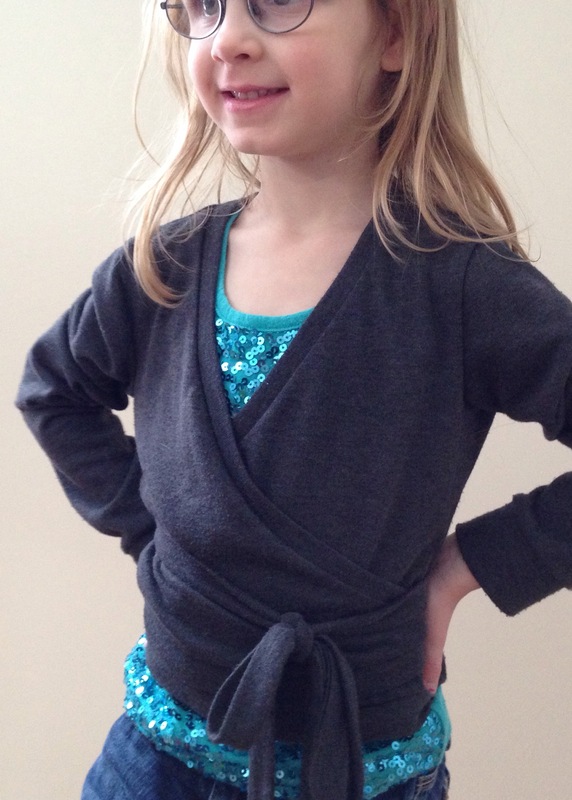 the regulation dance wrap sweaters are $20-25 each, and i made two for under $15, with fabric to spare. this is one of those cases where making it was a huge money saver. as you can see, the sleeves are ridiculously long. in burda’s defense, Isabella is quite small for her age. 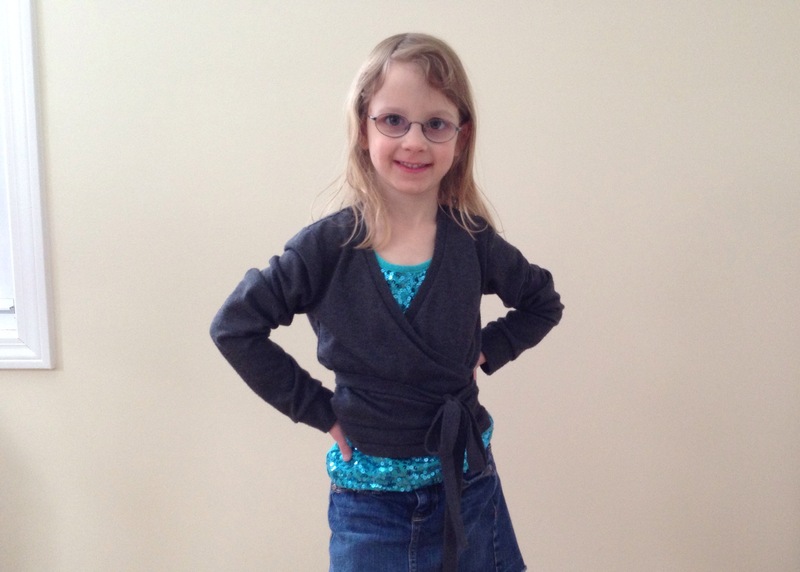 i don’t have any modeled pics of my other daughter, sylvia, but the fit on her is much better. still large, but not comically so. the girls love their sweaters so much, they’ve hardly taken them off since i made them! they have worn it with dresses, leggings, skirts, jeans, you name it. this turns out to be a much more useful sweater than i would have anticipated. 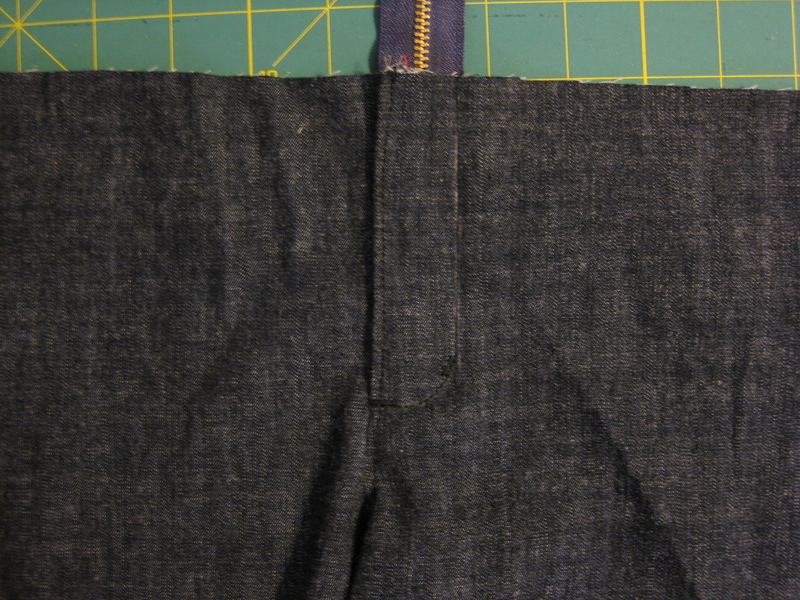 for a long time i struggled with getting my waistband corners to turn out well. it seemed that nothing i tried would produce anything even close to a neatly squared off corner. i tried everything—trimming, pressing, taking a diagonal stitch, jabbing with anything sharp i could get my hands on… but finally, finally i came upon a fool-proof technique. no, really. you’re skeptical, and i understand, but trust me: this one actually works. 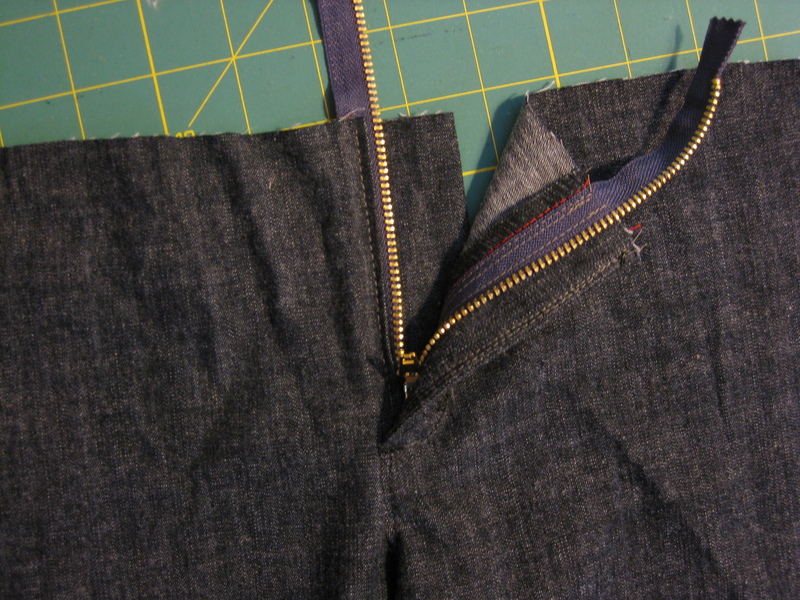 begin by sewing your waistband and waistband facing together at the top edge. sew all the way across, then press, grade, and under stitch all the way across. 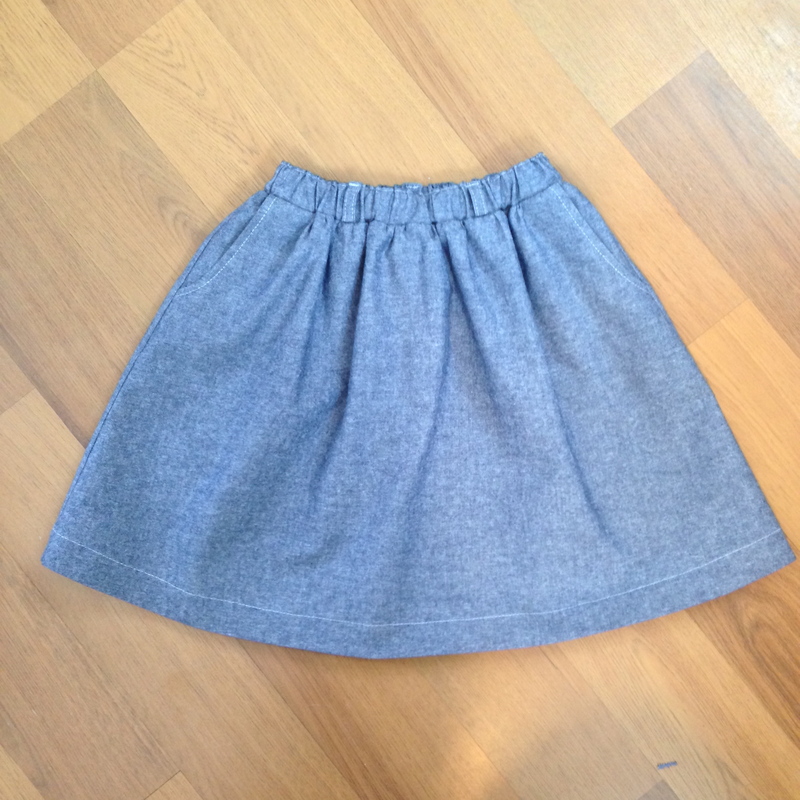 attach the waistband to your pants/skirt. 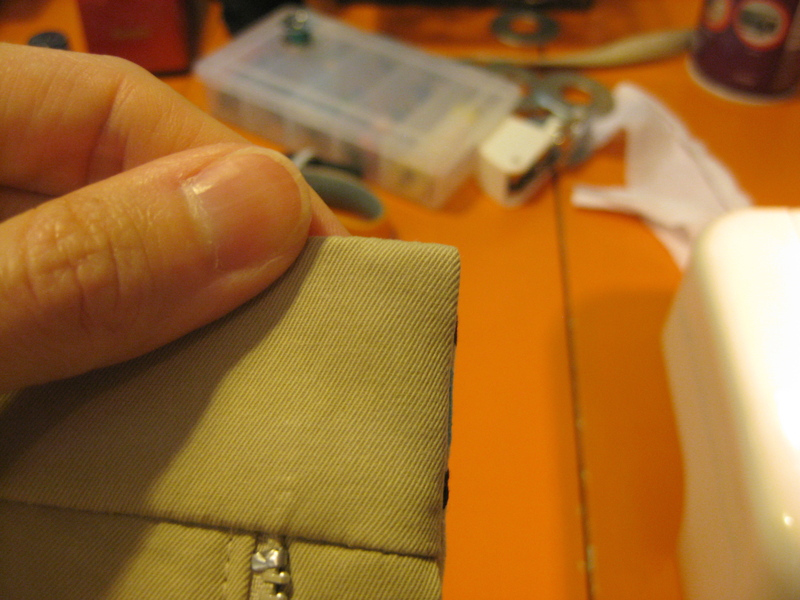 give it a good press, and double check that your fronts line up nicely at the waistband seam. if all looks good, grade the SA. 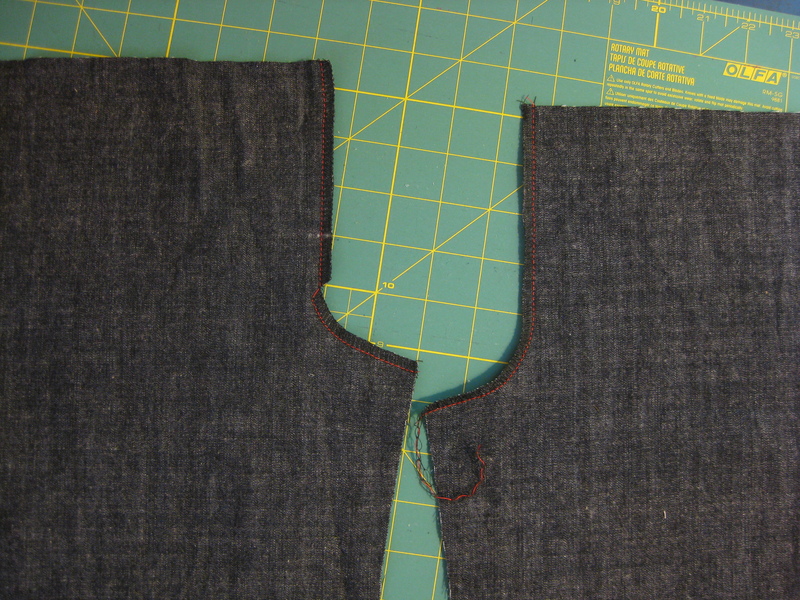 now we’ll sew up the short sides of the waistband. 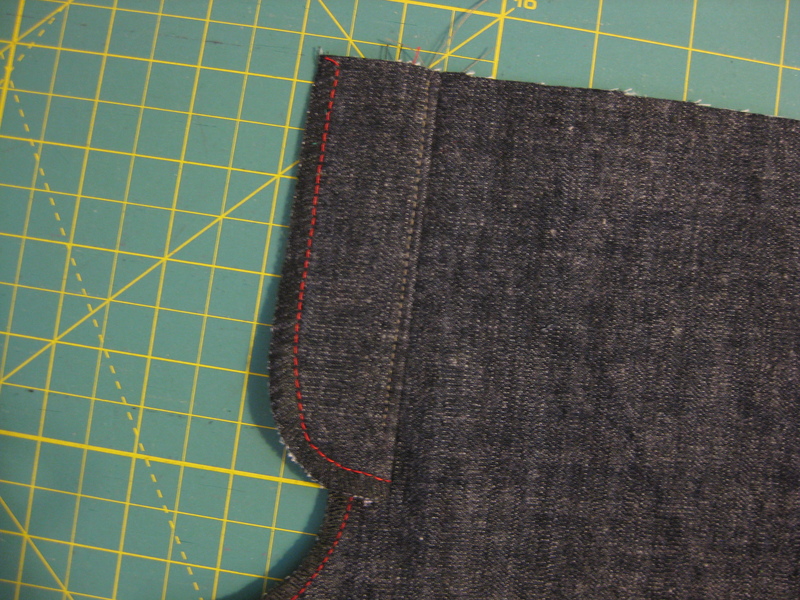 from the front, fold the waistband facing over the waistband (RST), making sure you grab the whole upper seam allowance. it has been under stitched, so just make sure everything is nicely lined up. 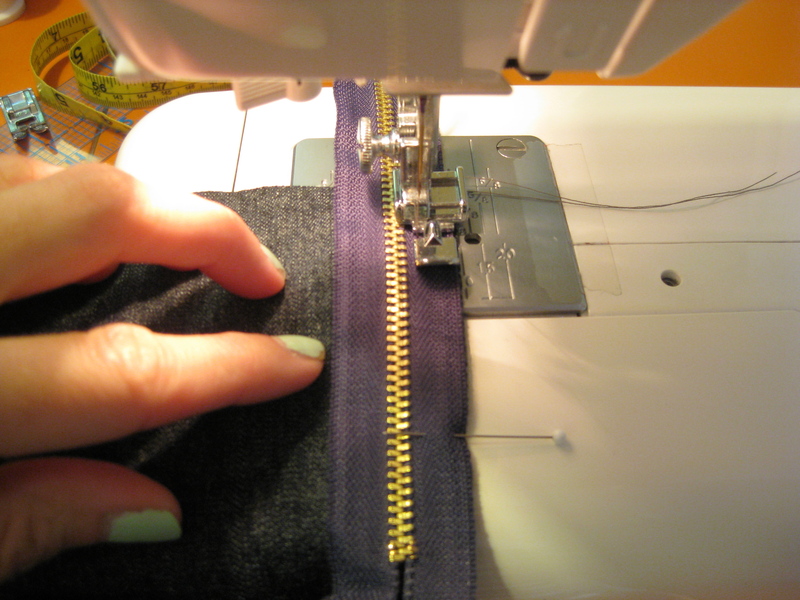 stitch up the short side, making sure that your stitching hits right next to the pant/skirt opening without catching it in your stitching. trim the SA down to 3/8″—no smaller. no smaller you hear? the only bulk i remove is that little snip you see there. get ready, here’s the cool part: fold the SA back and pinch it with your fingers right at at the corner. 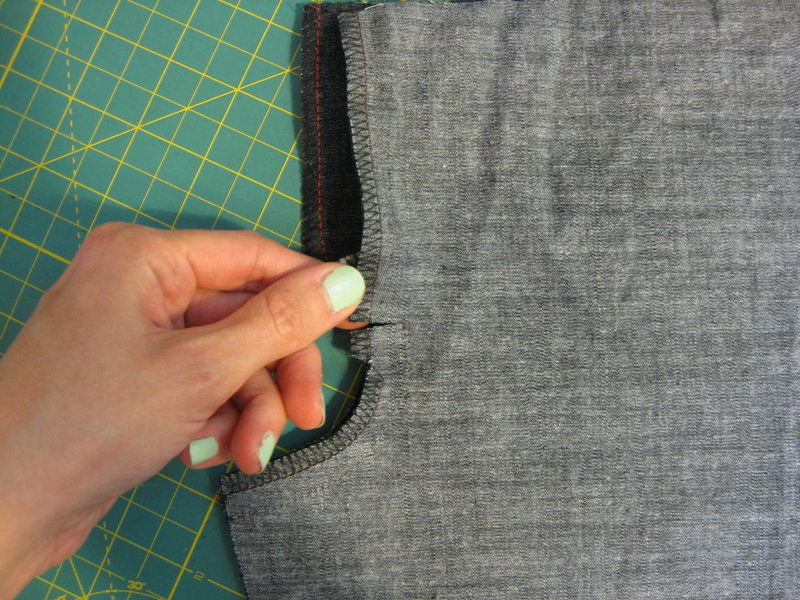 while pinching, pull the waistband right side out. 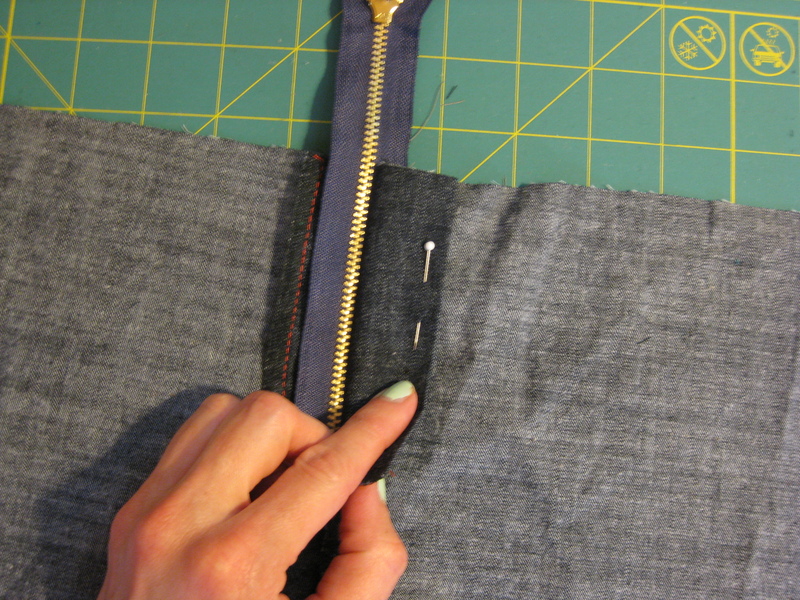 then kind of take the seam and rub it in between your fingers to work that seam out. if it doesn’t quite lay square yet, take your point turner and don’t just start poking willy nilly!!! 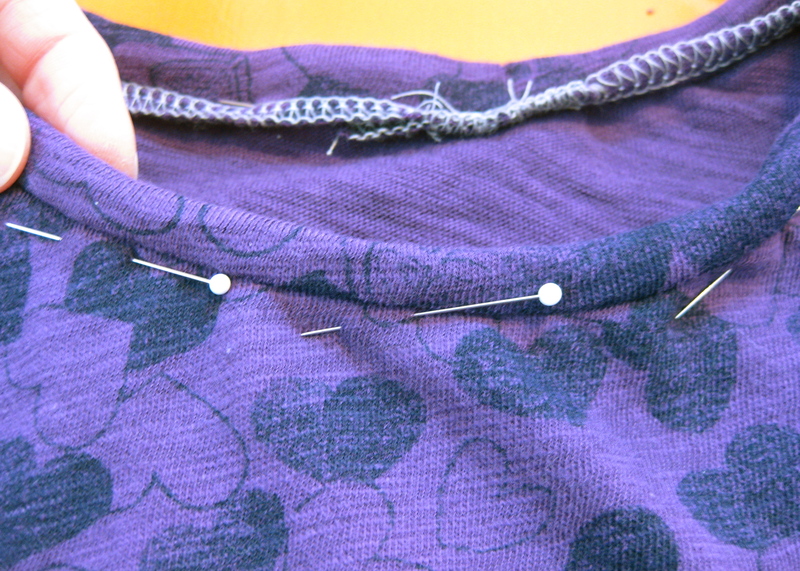 place it between the layers of fabric to finish squaring out the corner. here’s the finished corner before pressing. the whole key to this working is allowing the layers to be neatly folded up inside. keeping the SA’s strengthens the corner and encourages it to keep it’s shape. 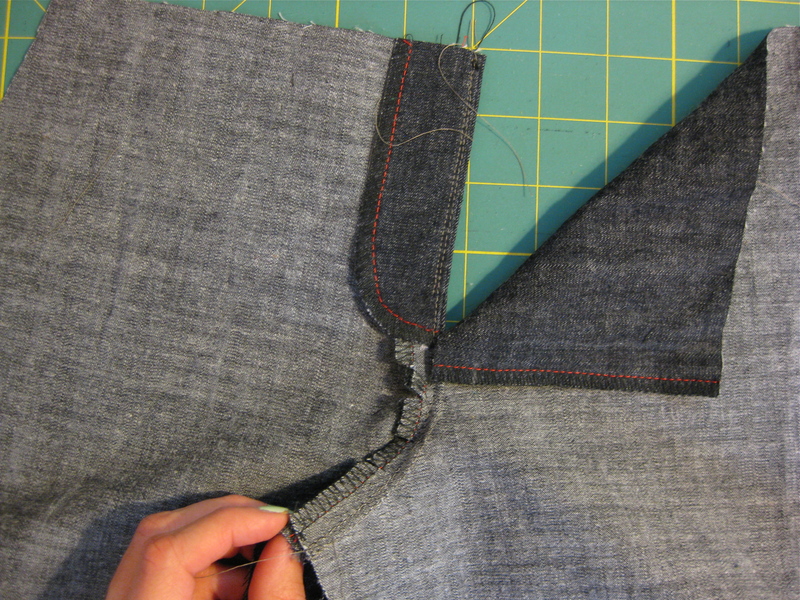 when you trim close to the corner as we’re all told, you weaken the seam and lose all that interior structure. then when you jab and jab to get that point out, you stretch out the fabric and just end up with a wad of fabric jammed into the corner. it will never lay nice and square that way. you can even see the folding action from the outside. go grab one of your RTW pants and you’ll see the same thing. moral of the story: fold, don’t jam. and finally enjoy those perfect corners you’ve always dreamed of. 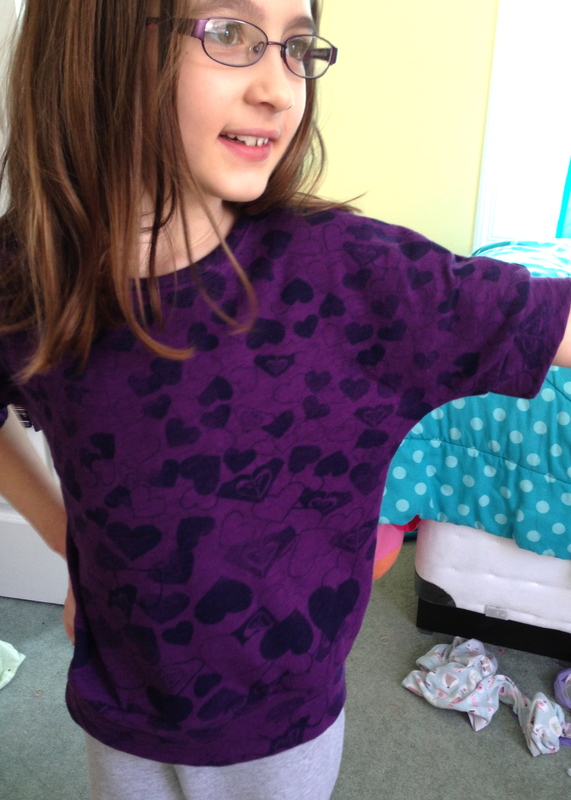 here is a little top i made for my daughter. since i have recently discovered the awesomeness that is the dolman tee, i decided to make one out of a knit fabric i bought from gee i wonder where… girl charlee. this is one of those roxy prints, which i bought mostly because purple is her favorite color. it’s kind of a strange fabric… it’s a burnout but just barely, not a ton of stretch, and it’s medium weight. 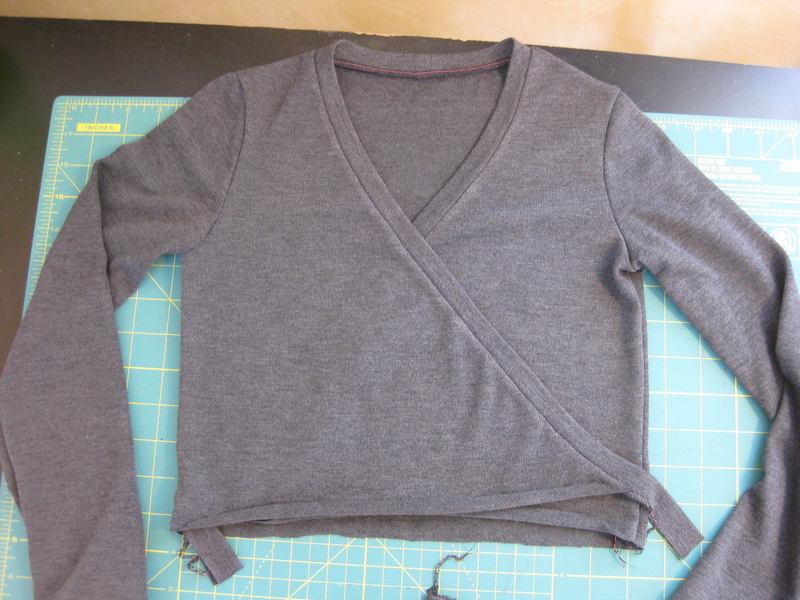 i assume there isn’t a kid-sized dolman pattern out there so i drafted my own based on a regular knit tee pattern i had. 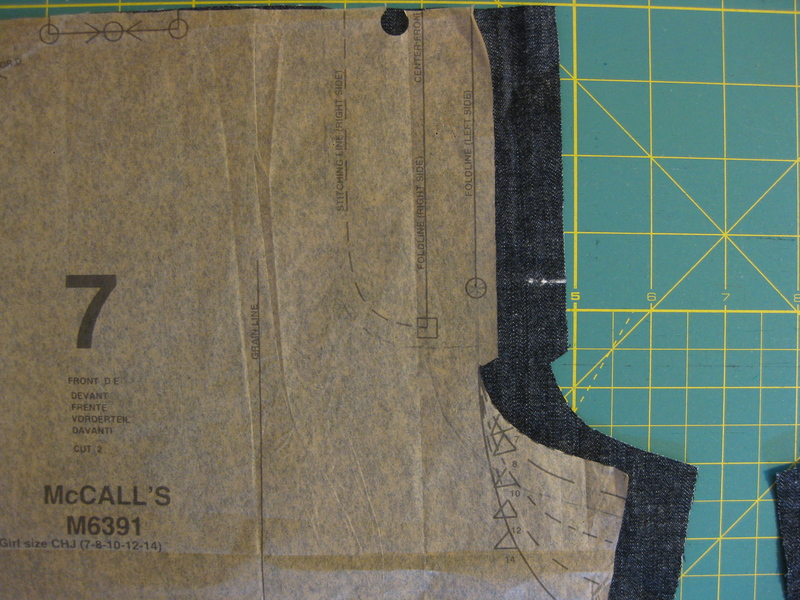 assuming this pattern ran large, i traced off a size 8. to get the dolman shape i took the sleeve pattern piece and lined it up at the shoulder seam then let the bottom seam sit on the seam line under the arm. i taped the pieces together then traced out a dolman shape under the arm and added the upper seam allowance where the shoulder seam extends down the sleeve. i used the same piece for front and back and simply drew in a different neckline for the front (just as the cation designs dolman tee is printed). 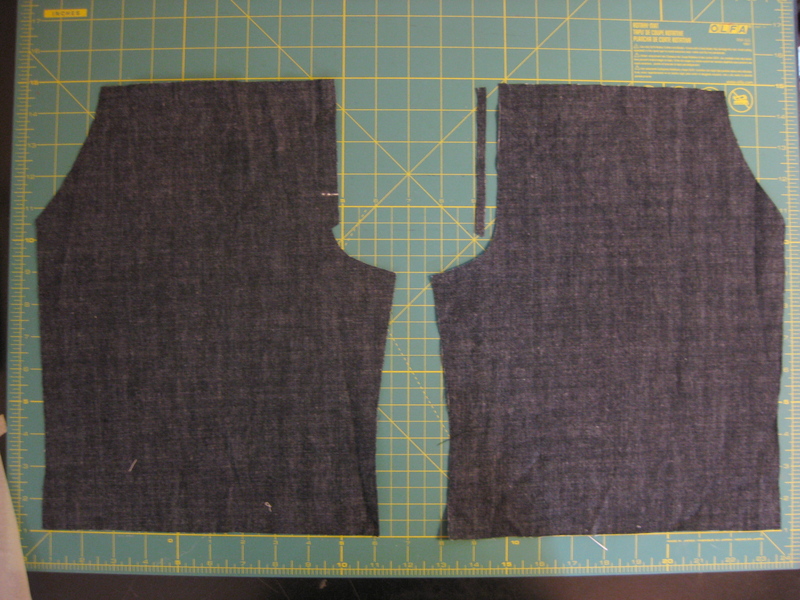 i guesstimated how long the arm and hem bands needed to be and cut a binding strip for the neckline. this narrow binding is becoming one of my favorite neckline finishes. i’ve done it several times and only casually mentioned it here on the blog… so to let you in on my awesome binding method, here’s a handy dandy tutorial for you! 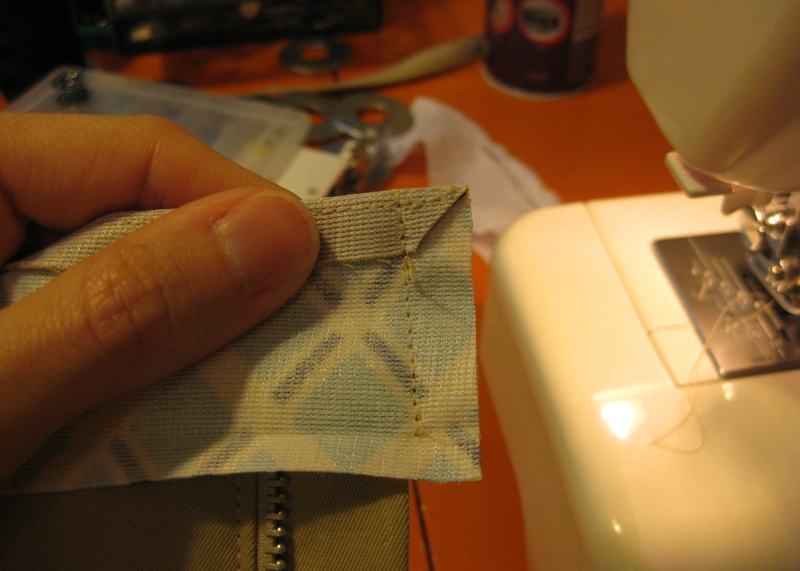 this binding method is most similar to a regular bias binding for wovens. make sure that the edge you are binding is without any seam allowance, or that you have added width to your pattern if you are replacing a banded finish. 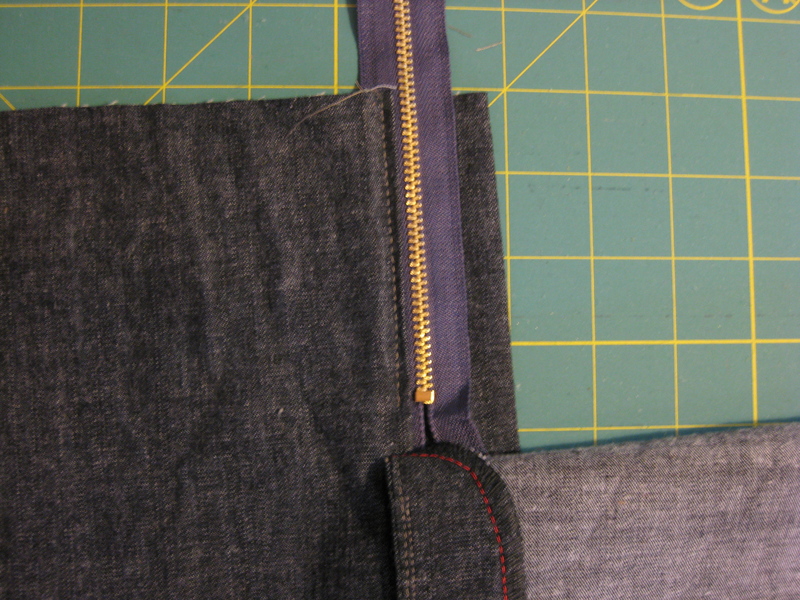 cut a strip of knit binding on the crossgrain (or bias if you’re dealing with stripes) to retain stretch. it should be about 1 1/4″ wide and a couple inches longer than your neckline. 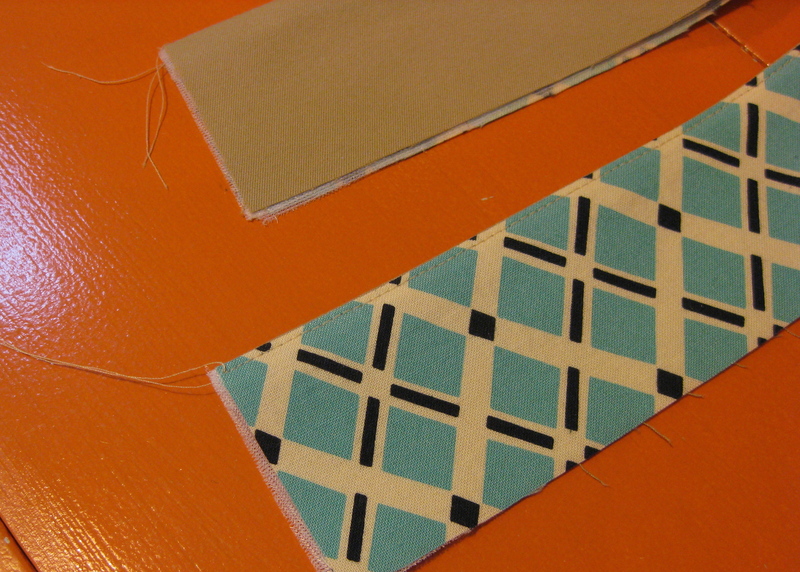 (note: my binding strip is cut 1 1/2″ wide and ended up being wider than necessary.) if you choose, serge one edge of the binding strip. 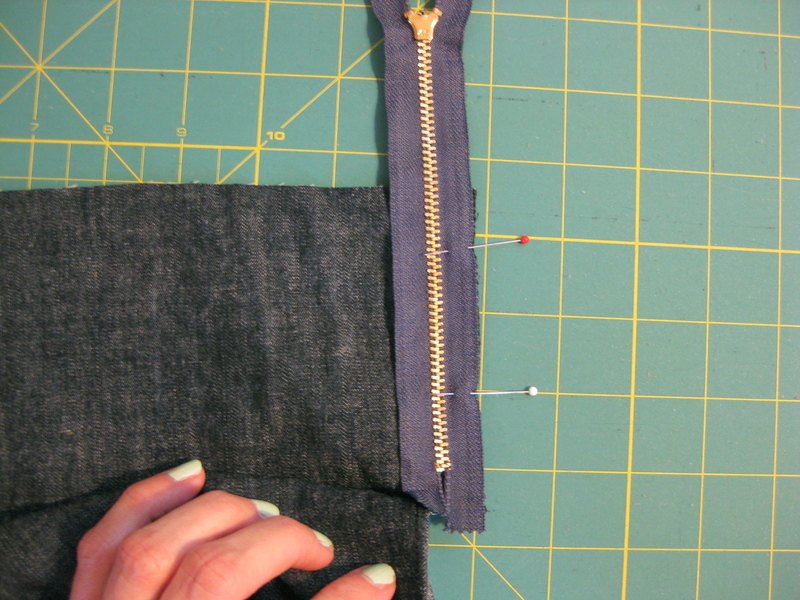 this is not absolutely necessary, but later when you topstitch i feel like the serged edge gives the topstitching something to grab on to and is a little more secure than a raw edge. 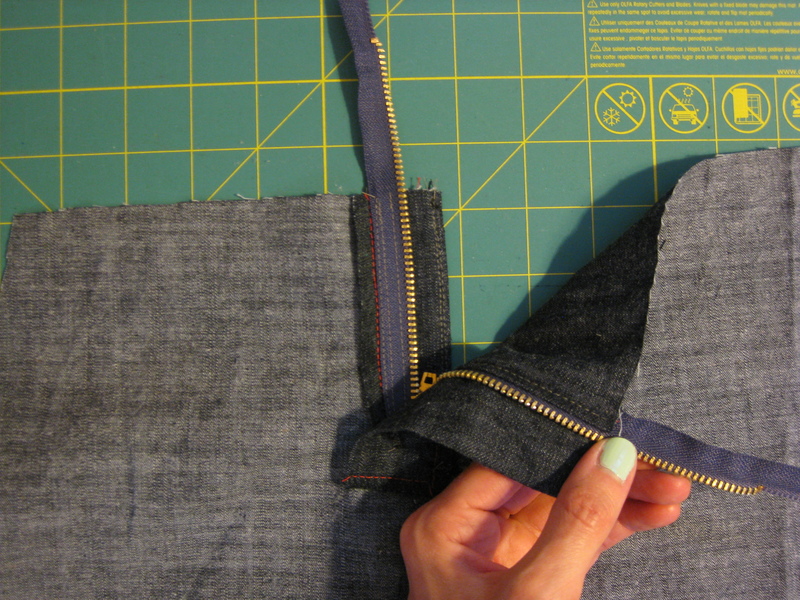 after sewing the shoulder seams, take the binding strip and line it up with the edge of your top, right sides together. 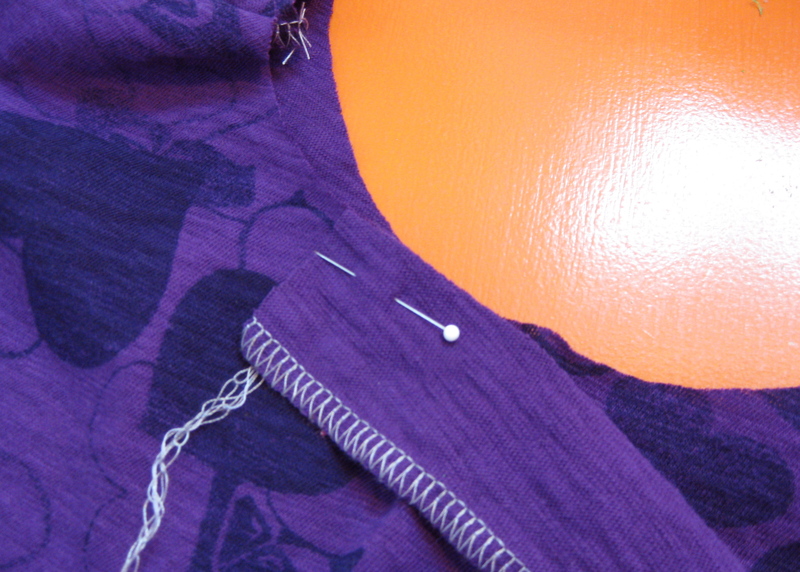 serge the binding all the way around the neckline edge and stretch the binding as you sew. no need to be gentle here, just try to keep the pressure as even as possible, stretching a little harder as you go around any curves. 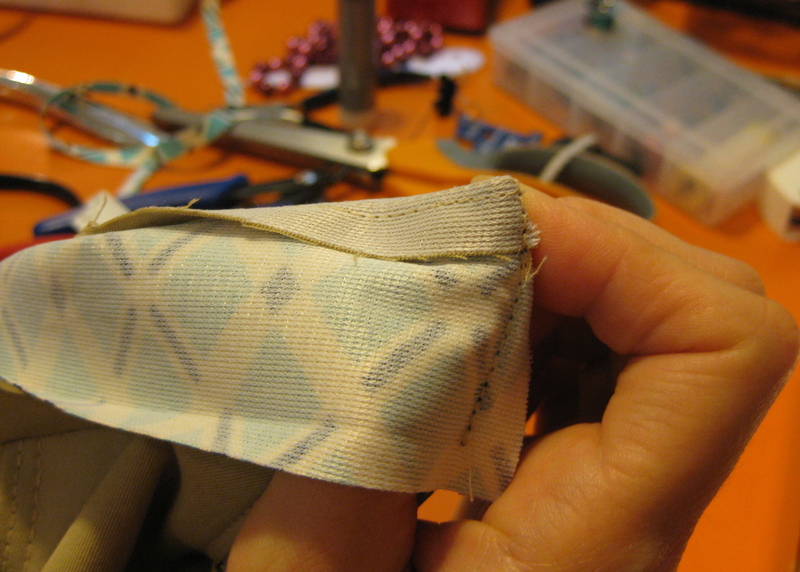 i usually stretch the binding, hold it in place, then serge an inch or two at a time; stopping and starting as i go. 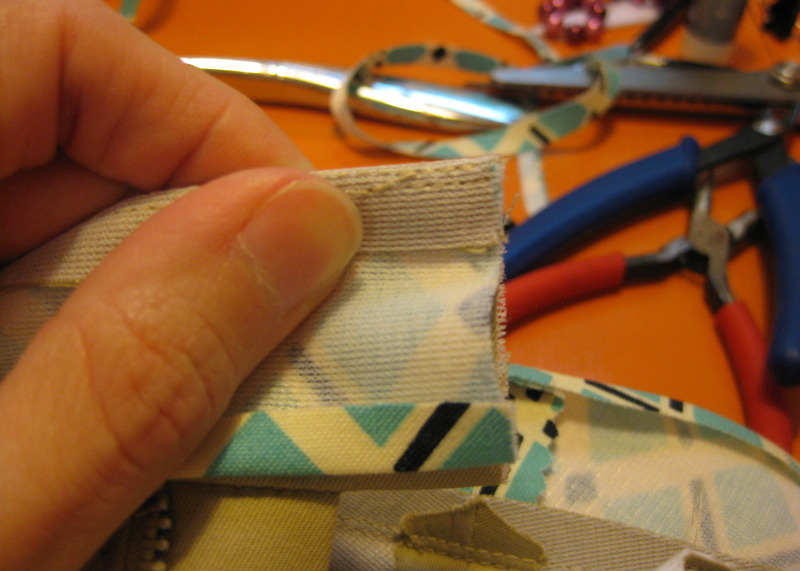 once you are almost back to where you started, trim your bias strip so you have 1/2″-1″ overlap, and just let the ends overlap. sure you can stop serging, piece the binding together then finish attaching if you really want, but i have found that this tiny raw edge is virtually unnoticeable (and believe me, i notice everything!) and is definitely less bulky. serge the free edge of the binding together at the overlap. 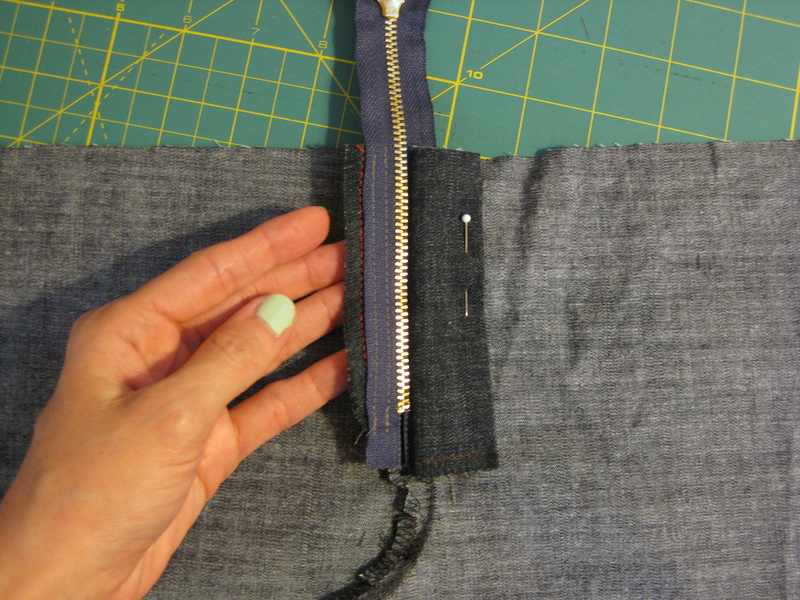 from the outside, press the binding strip up then fold it over the edge to the inside; the edge of your top should be encased in the binding, not folded over in any way. pin the binding in place all around the neckline then twin needle top stitch either directly on the binding strip or just below as i have done here. i find that stitching on the binding is a little harder to do evenly, and works best on thinner knits. if we’re close to medium weight i would stitch outside the binding. give it all a press and admire your handiwork! note: if you want a cleaner finish on the inside, you can turn the binding strip under (from the inside) before topstitching. just make sure you calculate the right width for the binding.